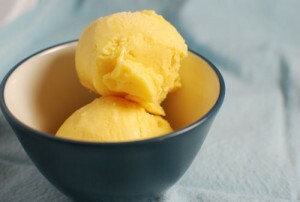 Delicious Mango Ice Cream recipe by icecream at DesiRecipes.com. Easy to prepare. Yummy in taste. Milk powder: 2 cups, add a little water to make thick milk. Put all ingredients in a food processor and blend thoroughly. Pour in a freezer container, cover and freeze for 24 hours.